An entire village has been buried by a major landslide in the central Philippines following heavy rains. Nineteen people are known to have died and 83 have been found alive so far, but rescue officials said between 1,500 and 2,500 might be buried in the mud. President Gloria Arroyo ordered the coast guard and navy to the affected area, and a US vessel is on the way. However rescuers, struggling waist-deep through thick mud, have called off their search, fearing further slides. A school and an estimated 500 houses in the village of Guinsaugon, in the town of St Bernard on the southern part of Leyte, were swamped by the flow of mud. Survivor Dario Libatan said: "It sounded like the mountain exploded, and the whole thing crumbled." Another spoke of boulders bigger than a house sweeping into the village amid the torrent of mud and earth. Television images showed only coconut trees and a few tin roofs emerging from the reddish soil. "Everything was buried," survivor Eugene Pilo said. "All the people are gone." The mudslide happened after heavy rains dumped about 200cm of rain on the area in the space of 10 days, Eva Tomol, a board member for the Southern Leyte provincial government told the BBC News website. She denied that deforestation caused by illegal logging may have contributed to the disaster. The BBC's Sarah Toms in Manila says the area lies in the path of several typhoons each year, and that coconut trees common locally have shallow roots which leave it vulnerable to landslides. Southern Leyte province Governor Rosette Lerias said many residents had left last week, fearing landslides, but had begun to return as rains eased in the past few days. She said the school that was buried had about 250 pupils and teachers. "We have been able to rescue only one child and one adult from the school area," she said. 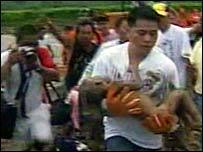 Army Captain Edmund Abella, leading a team of 30 army rescuers, said his soldiers were sinking into the mud. "It's very difficult, we're digging by hand, the place is so vast and the mud is so thick," he said. President Arroyo urged her compatriots to "pray for those who perished and were affected by this tragedy". "I have ordered the Coast Guard and our entire naval force in the Visayas [central Philippines] region to the area," she said in a television address to the nation. Richard Gordon, chairman of the Philippine Red Cross, speaking in Geneva, said it would be some time before the final death toll was known. "This could rise to tragic proportions. We're still hoping this is not the case... It's impossible to predict what nature will do." The landslide followed reports of a minor earthquake in the area on Friday morning. But David Applegate of the US Geological Survey told the BBC News website that the magnitude 5.2 quake off Iwo Jima was "very unlikely" to have been the cause.